Building a US military base at Henoko, Okinawa, is going to work against Washington's efforts to strike a new trade deal with China and de-nuclearise North Korea by heightening tensions in the Asia-Pacific, deems Robert Kajiwara, a Hawaiian human rights activist with Okinawan roots. "No country wants a rival country's military base located directly outside their borders", the activist told Sputnik. "All this base is going to do is cause both China and North Korea to spend billions of dollars more on bolstering their own military defences. If a conflict were to occur, this base would be easily destroyed by China and/or North Korea. Three thousand marines would be no match for a million-man army, or for high-powered missiles. It would take only around 10 minutes for missiles from China to reach and destroy Okinawa". Kajiwara, who is a cultural ambassador for his ancestral village of Nakagusuku, Okinawa, and special envoy for the Hawaiian Kingdom, stressed that he has long been "urging the US to form more peaceful and friendly relations with both China and North Korea, and President Trump has also indicated an eagerness to do that". On 8 December 2018, the human rights activist launched a petition on the White House's We the People website against the relocation of Marine Corps Air Station Futenma to Henoko Bay, in Nago. The petition calls upon President Trump to stop landfill work in Okinawa "until a democratic referendum can be held" by Okinawans in February this year. It has already received over 209,000 signatures. "This is great, especially when considering the censorship we've received from Japan's Prime Minister Shinzo Abe, as well as a total lack of major US media coverage", Kajiwara underscored. However, to further spearhead his initiative, the activist wrote an open letter to President Donald Trump on 19 January 2019. "I decided to write to President Trump because I have lost all confidence in the Japan government to do the right thing, due to their intense prejudice against Okinawans", he said. "I am hoping Americans will be more supportive. The White House has not yet responded. According to their own rules, they have 60 days to respond since we hit the 100,000 signature mark on 18 December, although we are hoping to receive a response much sooner than that due to the urgency of the situation". In his letter to the US president, Kajiwara pointed out that the construction of the new US military base would destroy a natural reef that is home to hundreds of rare and endangered species: "The reef is being called the second most biodiverse reef in the world, only behind the Great Barrier Reef", the letter highlighted. But that is not all: The strategic importance of the US military base in Okinawa also raises questions, the activist underscored. "The US military as well as members of the US government have stated in the past that this base at Henoko is not important to America's security, since the marines would not be used in the event of a conflict in Asia", Kajiwara elaborated. He noted that "the US military as well as Japanese government themselves have stated that Okinawa offers no special strategic significance but happens to be the location due to political considerations". 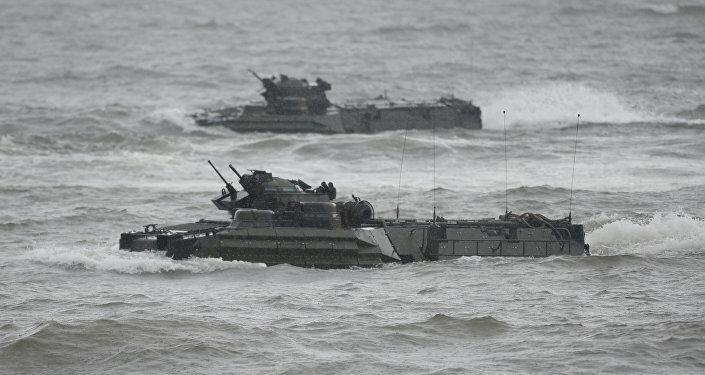 On 19 December 2018, former US Army Colonel Lawrence Wilkerson, who worked as the chief of staff under George W. Bush, told Ryukyu Shimpo, an Okinawan newspaper, that stationing US Marines on the island was "strategically unnecessary", but merely cheaper than maintaining them in California. Wilkerson and other members of the Overseas Base Realignment and Closure Coalition (OBRACC) sent a letter to the White House and Congress requesting the closure of the base. The construction of a new military base which is both "unwanted" and "unnecessary", and may require "billions of dollars over budget", as the activist highlighted in his letter to Trump, citing concerns over soil conditions at the new construction site. "It's time to bring the troops home, cut unnecessary spending, reduce America's overseas military burden, and build more peaceful and friendly relations with both China and North Korea", Kajiwara wrote to the US president. According to the human rights activist, "the Japanese government has long been extremely prejudiced against Okinawans, which is why they have placed an excessive amount of military bases in Okinawa". "The Japanese don't want the bases in Japan, so instead they place them in Okinawa", the activist said. "Okinawa was an independent country until 1879, when Japan illegally annexed it. Japan of course went on to annex many other countries, such as Korea, China, and the Philippines. After World War 2, all those other countries received their independence back. Only Okinawa did not, because both Japan and the US are using it for their military ambitions". The southern Japanese island of Okinawa, which accounts for only 0.6 percent of Japan's territory, hosts over 30 US military installations — more than 70 percent of their total number in Japan — with about 25,000 US troops stationed there. According to the Japanese authorities, the significant US military presence is necessary to ensure the nation's security. However, a large-scale protest movement has been going on across the island over the past years. The issue of relocating Marine Corps Air Station Futenma remains at the focus of attention of the Okinawans, who want the base to be relocated outside the prefecture.